Changing Triumph 1945-1974 drum brakes. 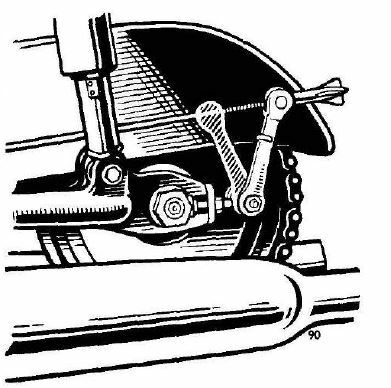 | JRC Engineering, Inc.
Changing Triumph 1945-1974 drum brakes. 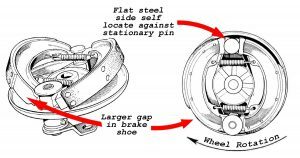 Installing Triumph rear brake shoes 1945-1974 drum brakes. 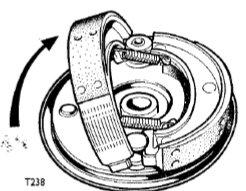 Triumph rear brakes as used on most models from 1945 to 1974. Rear drum inner diameter is 7 inches. Lining thickness is .177-.187 inches. Brake drums came with machined on teeth in 47 tooth (37-0951) and 43 tooth versions (37-1276) or with bolt on sprocket (37-1498 CEI bolts or 37-3585 UNF bolts, sprocket 37-1499 47 tooth). Triumph used a 7 inch rear drum brake with cast iron drum basically unchanged for 30 years. However the shoes did change in 1963. 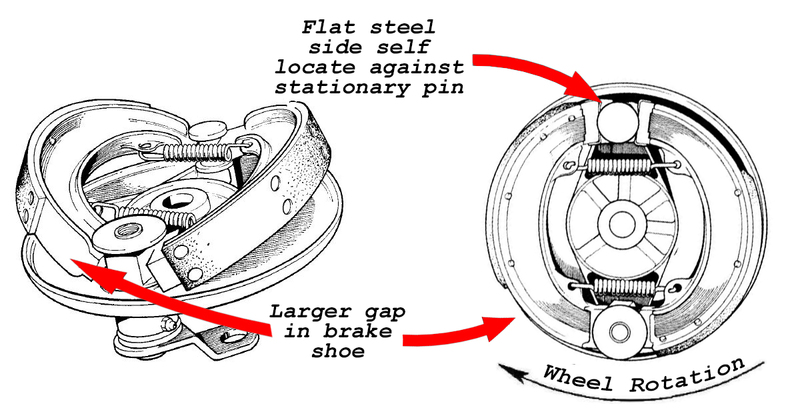 1945-62 rear shoes were identical and had a half moon relief to rest on the stationary pin opposite the brake cam. The part number for these shoes was W93 and were not directional. These are superseded by 37-1406 and 37-1407 directional shoes that are direct replacements and fully interchangeable. The old condition W93 are no longer available and should be replaced with the later style due to the greatly increased braking achieved with the new style shoes. Correct method of removing old shoes. Do not try using a screwdriver to pry the spring off! Example of hole for lubrication, take the chance to clean while doing brake maintenance. When reassembling the backing plate to the brake drum apply the brake while tightening the axle nut to centralize the backing plate to the drum. When the shoes are in good condition and the drum is within specification the brake lever should operate in the range illustrated. It may take some miles to work in the new shoes to the drum so be careful for the first few uses until the shoes have seated.